Axis couplers are still on their way from China so steppers are currently attached using pair of hoses. This patented technology allows us to test a little bit and meanwhile we’ll order the next required parts. The actual cutter part. We’re considering Makita RT0701C which was praised on Shapeokon forum. Also, X and Y axis are missing extra trapezoidal threads on which makes the apparatus more stable. Pair of steppers are needed for them, too. 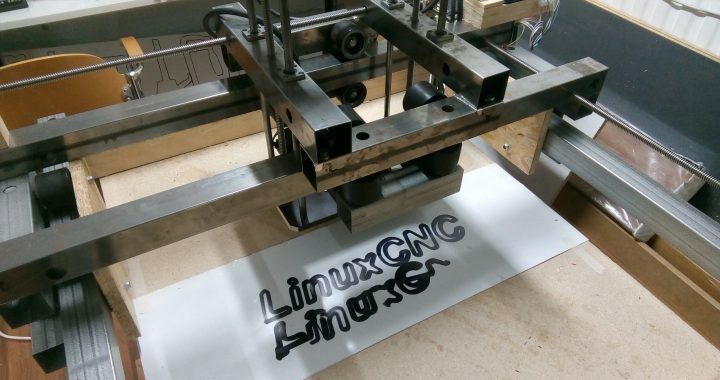 LinuxCNC configuration file is still a bit mysterious. Steps per millimeter must be calculated correctly and acceleration tests must be done.